Despite the presence of our good friend, Erik Zuckerman, we couldn’t take much from My Soul to Take, except misery. Meanwhile, Stuart airs our dirty laundry on air, Elliott does some more comic strip movie casting, and we learn the surprising internal organ-based source of Dan’s perversions. 0:00 – 0:34 – Introduction and theme. 0:35 – 6:43 – The technical difficulties saga continues. 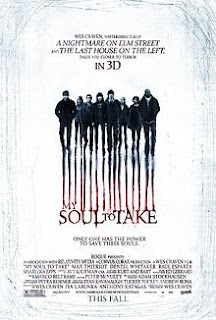 6:44 – 30:01 – It’s always take, take, take souls — never give! 56:20 – 57:32 – Goodbyes, theme, and outtakes. The PODCAST AWARDS nominations are open! Elliott’s next 92Y Tribeca screening of Island of Lost Souls, starring Charles Laughton, with special screening guest John Hodgman. When voting for the podcast, what genre would you fine gentlemen like to be considered in? Film, comedy, etc. You don’t have to choose! The description of the My Soul to Take portion of the podcast is giving me serious déjà vu. Goddamn, I love me some Bloodthirsty Don Knotts. Or ‘Please, it’s “Mister of Horror”—“Master of Horror” is my son.’. And how does an electron try to get girls? …by ‘neg-ing’.